Little known even to many Japanese people, Sunamachi Ginza is one of the best local shopping streets in Tokyo. The shops of Sunamachi are mainly family-run businesses selling osozai (prepared food) and each has maintained its own unique flavor for more than 60 years. On this 3.5-hour walking tour, meet local vendors, sample delicious dishes and drinks, and learn all about Japanese culinary culture. Meet your guide at 9:15 am or 10:45 am (depends on your request.) at JR Kinshicho Station to begin your 3.5-hour walking tour of Sunamachi Ginza. (You could choose departure time.) Get ready to enjoy some delectable food while learning about Japanese cooking techniques and culture. With your guide, stroll down the vibrant shopping street of Sunamachi Ginza, dipping in and out of shops along the way and sampling their wares. 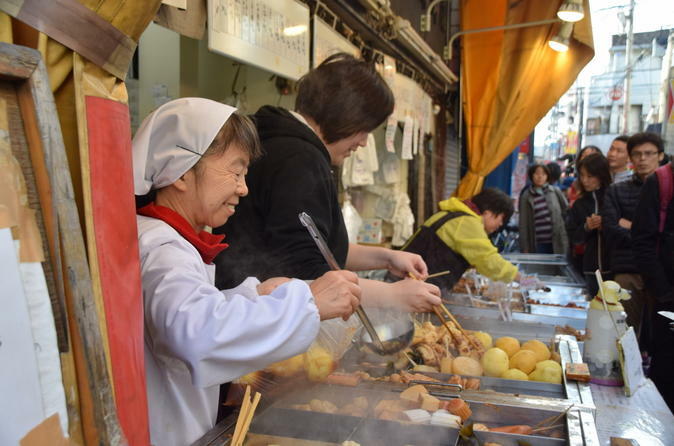 Try a vast array of traditional Japanese foods including inarizushi (tofu stuffed with rice balls), yakitori (grilled chicken skewers), and oden (a type of soup with many different ingredients), while soaking up the historic atmosphere. Make sure to try a glass of sake to wash down your lunch. After your tour, we come back to JR Kinshicho Station and give you directions on how to get to wherever you want to go next.